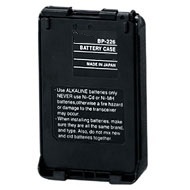 BP-226BA : Alkaline battery case for ICOM radios - replaces the BP-226. Load with 5 x AA dry cells (Alkaline, Lithium, non-rechargeable) for instant power ! Fits radios such as ICOM IC-M87, IC-M88, IC-E85, IC-V85, IC-F50, IC-F50V, IC-F51V, IC-F60, IC-F61 etc. Fits all ICOM radios that a BP-227 or BP-226 fit onto (commercial, marine, amateur, military). The case cover has a rubber gasket, to aid in water repellency. CBE-227: Battery Eliminator for ICOM IC-V85, IC-M88, IC-F50, IC-F50V, IC-F51, IC-F60, IC-F61 etc. Replaces BP-227 or BP-226; enabled high-watt operation from a 12-13.8VDC socket (in vehicle or portable pack). 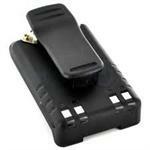 EMS-227:Desktop Rapid Charger for BP-227 (7.4v Li-ION) batteries. Provides safe, fast smart charge of your BP-227 Li-ION battery, with automatic shut-off when battery is full. Includes AC-DC Power Supply (worldwide input).